Chiropractic Internet Tools to Help You Grow! 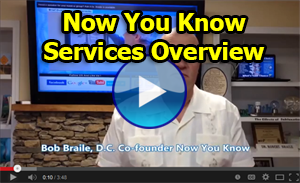 Now You Know offers the largest resource of quality information and education available in chiropractic. Using both passive and active technology, NYK gives you an extensive, well documented, and effective collection of in-office education material and media, fundamental for patient retention, referral stimulation, and practice growth. Using the Chiropractic News Services player, and the interactive NYK Kiosk, raises your office to new levels of effective patient education. Adding an informational website to the quality in-office education of the NYK Fundamentals system creates a community resource that helps educate and motivate those who may have never considered chiropractic care. The NYK ADJUSTable Web+SEO is the perfect blend of style, customization, search engine optimization, and education to effectively bring the message of chiropractic and your office into your community. Take the advantage by combining community outreach with your solid in-office and online educational resources in place from NYK's Fundamentals and Essential systems. The NYK Real-News Email Newsletter service allows you to reach out with quality information written to shift people to the chiropractic way of thinking. Additionally, the Bulk Emailing capabilities, with the Echiropractic Ecards and Messages services of the Advantage System, give you complete, ongoing communications and outreach abilities to your patient base and your community. We are chiropractors and technology specialists who developed systems of technology to help chiropractors grow their practices and spread the message of chiropractic. We are not simply a marketing company that decided to sell websites to chiropractors. Growing a practice requires a combination of community outreach, and in-office education. It is for this reason that NYK bundles our services into "Systems". Implementation of the NYK systems ensures the most effective way to stimulate more new patients both online and through referrals. Our chiropractic websites, chiropractic newsletters, and in-office Kiosk and CNS services are focused on changing minds and converting people to the chiropractic paradigm. Our user-friendly services can be easily implemented into any office and will yield results. If you have any questions, please contact our friendly and knowledgeable staff for a free live online demonstration.